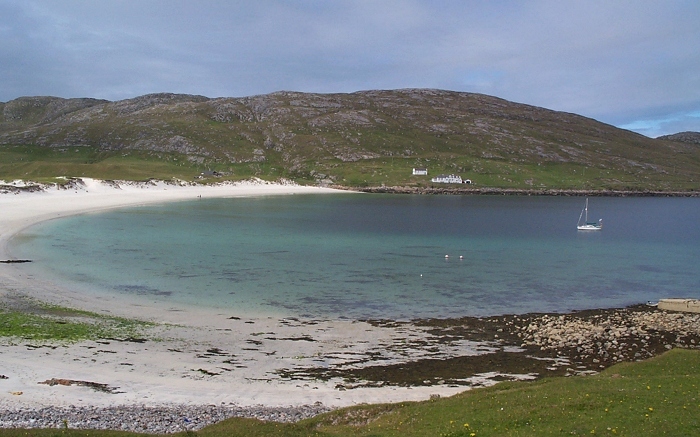 This summer's plan is a cruise up the east coast of the Outer Hebrides. We already have all the Imray charts of the area and I have made arrangements to get the Admiralty 1:100,000 charts 1794, 1795, 1796 (I don't plan to go further north than Stornoway). But now I have just received my Clyde Cruising Club directions for the Outer Hebrides and they seem to think I need several larger scale (more detailed; is that larger scale?) charts too. CCC says "Some of these are essential to the extent that it would be hazardous for a stranger to enter the waters covered without the appropriate chart." I do also have the Admiralty 2825, Lochs on the east coast of Uist at 1:12,500; almost by mistake - I think it was from a boat jumble. We will also have on board my new pride and joy, the Lowrance chart plotter with Nauticpath chart but very little experience with it and no idea how detailed the chart is in the crucail areas. At last, the question. Do you think we will need more detailed Admiralty charts? Or do you suppose the CCC directions are being especially cautious. I look forward to erudite responses in due course. cpedw wrote: I look forward to erudite responses in due course. Well that rules me out then. You'll be fine . . . If you just plan a potter up or down the E. coast visiting reasonably weel kent anchorages and ports you will be fine with the charts you have plus either the CCC pilot or the Lawrence offering. Both would be even better, and I can thoroughly recommend Hamish Haswell-Smith's 'Scottish Islands' as well. The one place you definitely WILL need large scale charts if you venture into it is the Sound of Harris - including the approach to Berneray. We'll be sailing in the same area in August. Nick's probably right about Imray plus CCC and Lawrence, however that could have the effect of limiting you to the weel kent anchorages and passages. Our sailing experience of the area is minimal - sailed round Mingulay to the Atlantic side and through one of the channels back to Barra. Some of the passages are pretty complex and I have to say that I'd strongly prefer the detail of the UKHO charts in this area. Cancelled UKHO charts sell for about Â£3 a shot at http://www.chartsales.co.uk/. As long as you check the almanacs and pilots for stuff like new causeways, second hand or cancelled UKHO charts should be fine, especially if combined with a reasonably up to date Imray IMHO. Enjoy the cruise! We managed the top of Skye on Imray two years ago. Much prefer more detailed Admiralty charts though. CCC and/or Lawrence should be aboard though. Thanks for the advice. We won't leave Oban until 22 or 23 July so we will miss the Festival of Sail. But we will be there during the first week of August so we might meet Shard. Keep a dual watch on 77 Derek. Silkie may well be going up the Sound of Mull on or about the 23rd.